Set up users so they can assist other users by creating and submitting expenses on their behalf. 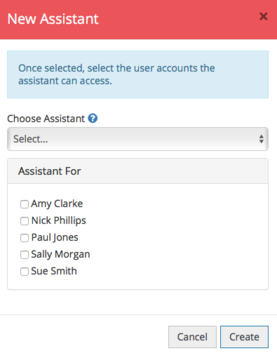 With the PA Assist feature, a user can have more than one assistant and will retain full access to all of the features on their account. In order to set up your assistants, they must have already been added to the account as well as the users they are assisting. 1. From Admin, click on PA Assist. 2. Click on the New Assistant button. 3. Choose the assistant from the dropdown. 4. Tick the boxes of the users who are being assisted. Once you're happy, click Create to add that new assistant. Now you have set up your PAs, they will have access to the assisted user's account(s).